David Stavanger, myself, Jennifer Compton. 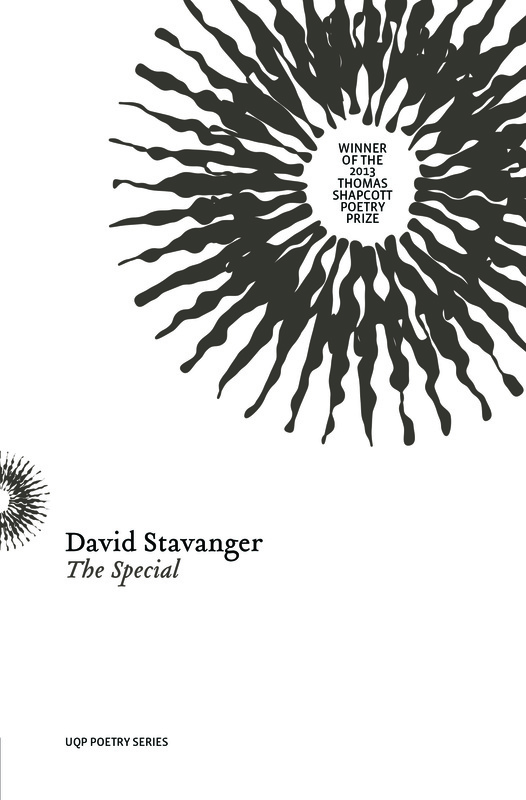 I had the pleasure last night of launching The Special by David Stavanger, winner of the 2013 Thomas Shapcott Prize. The book is published by UQP and available now. David and I didn’t know each other beforehand, but connected through words (in emails, but mainly through our work) and it was a wonderful night, with much warmth. 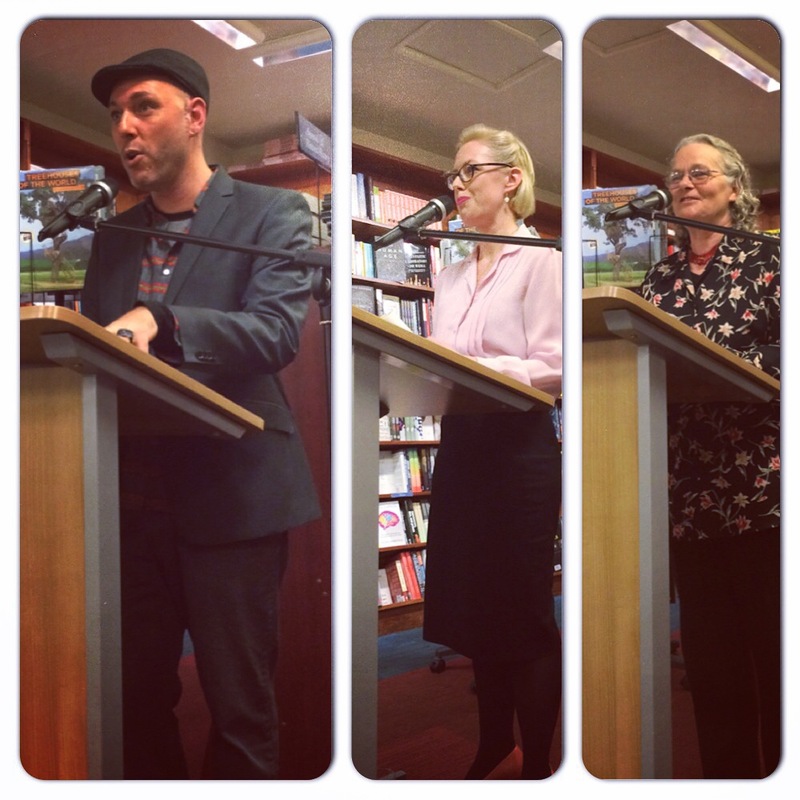 David asked me to read a few pieces from Captives before launching his book, which was kind. The legendary Jennifer Compton read also, and it was great to meet her. Her next book will launched in a couple of months. What I came away with from this collection was a series of images, connected meanings, and a mood. I can try to explain or capture that mood through this speech, but it may end up being slightly different for each of you. A poet allows for space in between the words, words that either spill like bodily fluid, or that are drawn slowly and agonisingly, like impacted teeth. The space becomes yours, the reader’s. I’ve already invoked some of the imagery in the book right there, that of bodies. Bodies tattooed, divided, diseased, under floors, naked, flying through air, young and old, on a plastic sheet, and featuring ‘so many exit points’ (that line being from the very affecting ‘Inheritance Triptych’). There are throats, lips, chests, colons and legs tumbling into feet (‘Baby’). The bodies are a source of fascination, but also of weight. It’s an effort to be bodily, to have conversations with other parents at the school gate. With his father, the poet states: ‘I am the ghost and he is the father.’ The body doesn’t fit right. Sentience is floating, not necessarily tied to the body. It may even be found in objects, like a fridge in the flood. A fridge that ‘mourns broken seals’ and ‘once dated an esky’. The emotional state is often worry, like when the ghost worries about his father. Worry plus a sense of fatalism leads to an absurd sort of humour. The worry doesn’t hide behind the humour, it’s present in it. The poem ‘The Future’ is a pinnacle of this, the worry almost seems a precursor to the events in this piece. There’s a sense of: yes, everything bad can happen, has happened, is happening, will happen. We just have to open another door, or keep walking a dead dog. And what else can we teach our children but to do this also? There’s also an expression, overall, of a sense of effort—the effort that everyday living requires. The poem ‘Digestives’ really sums this up: minding someone’s place, being alone and heartbroken, then locking yourself out, having to spend all your money on a locksmith, having nothing to eat but digestive biscuits. Then there’s ‘In the Palace of Broken Men’ which has lines like ‘sighing is the first act of the morning’, and ‘an unnamed smell in the bedroom’, and ‘bins put out not brought back in’. Just think about that for a moment, the bins still out on the street. it’s in the beauty only lunar suns undo. Who was I, at seventeen, to deny the ascent. Complementary to these themes is a thread of control. Having it, letting go, and others having it over you, even through words. A panic, but perhaps an inevitability, too, over a loss of control, is captured in one of my favourite poems ‘Straws’, where straws exist to keep mouths at bay, because the sensations of glass and ice would be too much. There’s definitely humour in the line: ‘feeling better if something is between: clothes, surnames, bodies of water’. And the final stanza, which I won’t ruin for you, makes you both smile and feel a short buzz of panic. The poem seems a parody of a human being who is trying to keep some distance from physical sensations and the effect they may have on them. Or perhaps it is a parody of the writer himself, fascinated by the straw between the mind and the words on the page, always some distance between them. Or, perhaps, it acknowledges the straw between the writer and the world. The writer as a person, always feeling, but as a writer, always looking down on the scene from above, distant from their own self. Maybe this is the distance between David and Ghostboy, his alter-ego. This kind of writerly distance, tied with a vision both warm and dark, made me think about a state or outlook described by Janet Frame, looking back on the time she was in a mental hospital and thought her plight was hopeless. It’s an incredible description, and I hope David and some of you find it relevant. I inhabited a territory of loneliness which I think resembles that place where the dying spend their time before death, and from where those who do return living to the world bring inevitably a unique point of view that is a nightmare, a treasure, and a lifelong possession; at times I think it must be the best view in the world, ranging even farther than the view from the mountains of love, equal in its rapture and chilling exposure, there in the neighborhood of the ancient gods and goddesses. The very act of returning to the world, however, tends to remove that view to the storeroom of the mind described by Thomas Beecham as ‘the room two inches behind the eyes’. One remembers the treasure and the Midas effect of it upon each moment, and sometimes one can see the glitter among the ordinary waste of each day. And with that I declare The Special officially launched. The quote is from Frame’s An Angel at My Table. Read an interview with David Stavanger on Verity La. Watch David’s performance as Ghostboy at Tedx Noosa (where he recites a couple of poems from The Special). 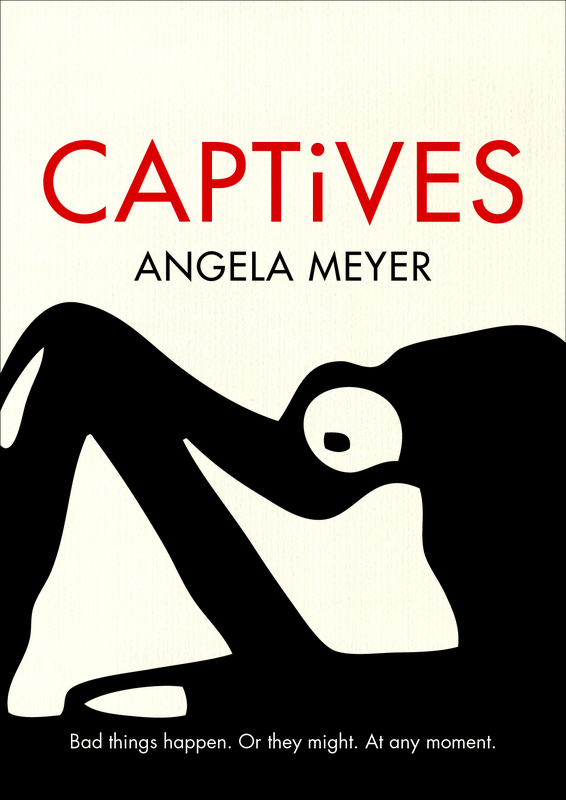 Highly evocative and beautifully rich, Angela, both your text and the snippets of Stavangar’s and Frame’s. Thank-you for posting. I will look forward to getting a copy of this collection soon.